This suit is semi stitch. fabric of suit is faux georgette. Comes along with a santoon bottom and net dupatta. In order to meet various demands of our esteemed clients, we are engaged in trading an optimum quality array of Punjabi Salwar Kameez. 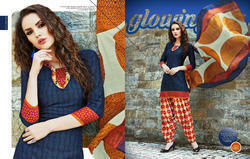 We are a reputed entity, engaged in trading a qualitative array of Fancy Patiala Suit. Keeping in mind ever-evolving requirements of our respected clients, we are offering a premium quality array of Cotton Punjabi Suit.